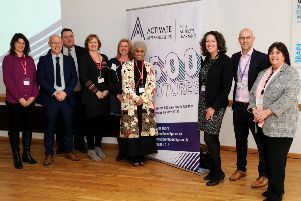 Activate Learning has been recognised for the work it does to inspire special needs students into employment with a coveted education award. The education provider behind three Oxfordshire college campuses, including Banbury and Bicester College, won the Support for Students’ prize at the 2019 Association of Colleges’ Beacon Awards last week. The award recognises Activate Learning’s innovative partnership programme for young people with SEND (special educational needs and disabilities). SEND students gain real life work experience either on campus at a college-run learning company, at an off-site work placement or on an external supported internship programme working towards a paid position. Activate Learning’s CEO, Sally Dicketts CBE, said “We are immensely proud to have won this prestigious national award. It is a real testament to our learners, staff, parents and partners. “We have put a great deal of effort not only into what our students learn, but how they learn it, and our unique Learning Philosophy sits at the heart of everything we do at Activate Learning. “The development of the student’s emotional intelligence is key to this Learning Philosophy and the development of personal attributes of both our staff and students is crucial to this. Activate Learning work with partners to improve life chances and create sustainable job opportunities for students with learning difficulties or disabilities. Since launching in 2013, the programme has supported over 1500 Oxfordshire and Berkshire SEND learners with work experience. Will Gardner, Unit Manager at Oxfordshire County Council’s Oxfordshire Employment Unit says: “Oxfordshire Supported Internship has been hugely successful in supporting young people to find and stay in work. “The quality and stability of the partnership between ourselves, Activate Learning and our delivery partners Mencap has been key to developing a programme that understands the needs of young people and local employers. Alison Pike, communities and programmes country director for programme partner Mencap said: "We are thrilled that our partnership with Activate Learning and Oxfordshire Employment has been celebrated by winning this richly deserved award. "It’s testament to the hard work that has been put in over the last few years to provide fantastic employment outcomes for SEND learners in Oxfordshire. We look forward to seeing the partnership continue to develop and support people with a learning disability."